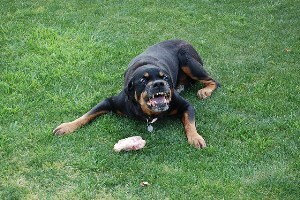 As a professional dog trainer, I can’t tell you how often, when called in to work with an aggressive dog, I have heard, “He showed no warning! He just bit!” While on the rare occasion, this may be the case, more often than not, your dog showed several warning signs that he was annoyed or not in the mood to be bothered at that moment. But many times, those signs are very subtle and oftentimes, overlooked. Even the most calm and gentle dog has its limit. 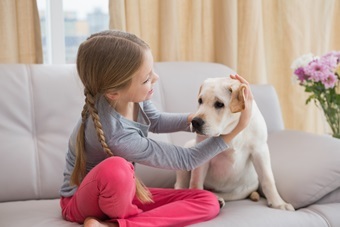 So how can you know when your dog has reached their limit, giving you ample time to remove your child from them prior to them ‘snapping’ at your little one? Since dogs can’t verbally warn us, it is up to us to understand what their body language is saying… because that is the primary way they communicate… and not all dogs do the ‘growl, snarl, curl your lip, and show your teeth’ thing first. Note: The intent of this article is to build people’s awareness of what a dog’s body might be saying, and hopefully educate you enough to keep you and your family safe around them. It is not intended to be a ‘crash course’ in making you an expert. Thousands of adults and children get bitten every year, most often by their own family pet, so this is a very serious issue. If you are not sure, but think your dog may be showing signs of aggression, regardless of their age or breed, please consult a professional and get help. 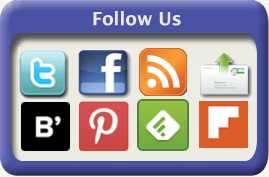 A great resource to locate a professional near you is the International Association of Canine Professionals (IACP). After dinner, all of the kids were in another room except for one of my nephews. Shayna was on the floor near the kitchen entertaining herself with a toy, and the adults sat around the table talking. In the midst of a conversation with my cousin, I saw my nephew out of the corner of my eye walking towards her. Apparently, Shayna saw it too, and from across the room, I saw her entire body change. She was on alert; and no one else seemed to notice. In mid sentence, I flew across the room and grabbed Shayna just as she opened her mouth to snap, missing my nephew by mere millimeters. WATCHING – This is the first phase of what we call ‘resource guarding’ or the guarding of their possession and it is a very subtle ‘shift’. 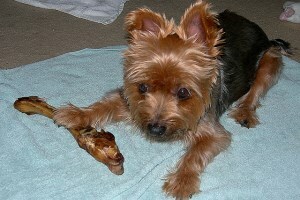 When a dog is chewing on a bone, eating their food, or playing with a toy, they are 100% in that moment. Their eyes may glaze over, they may seem like they’re in another world, but everything is about that item for them. However, for a dog who is resource guarding, when they become aware that a potential ‘threat’ is nearby, they will continue to chew, but their eyes are now locked on the approaching intruder. Their head does not move, just their eyes… and they are watching every move the person (or potential threat) makes. An important fact was reiterated at the last IACP conference by a trainer named Brenda Aloff who lectures on canine body language. A dog’s body language was really meant for other dogs to be aware of, which is why sometimes it seems so subtle to us. It was not really meant for us. 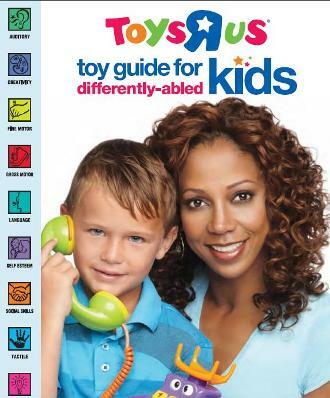 That being said, the average person would look at this and say, “Oh, how cute… 2 puppies sharing a toy.” Look again. Notice the difference in body language with the two dogs. 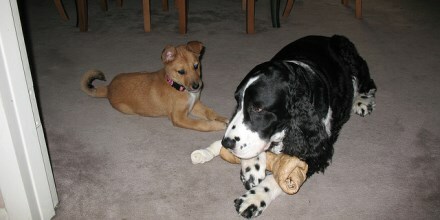 The one on the left is happily chewing on the toy, not really caring about the other dog being there. Unaffected by the presence of the one on the right, it is relaxed, and hunkered down over the toy with his paws wrapped around it..
Now, notice how the one on the right is still chewing on the toy, but the eyes are wide, and very alert to its surroundings. The body is more rigid, and it is closely WATCHING for a ‘potential threat’ at the same time. This is referred to as being ‘reactive’ and ready to defend its territory if the need arises. FREEZING IN PLACE – The next thing I saw shift in Shayna’s body when my nephew approached was also VERY subtle… but to me, very obvious. She stopped chewing on the toy completely. Essentially, her body ‘froze’ in position. Since dogs cannot multi-task, she could not calmly continue chewing on the toy and watch as my nephew got closer to her at the same time, so she chose at that moment to watch his every move. Her body freezing at that moment told me that she was waiting to see if the ‘threat’ was going to keep on moving by, or stop and possibly take her toy. 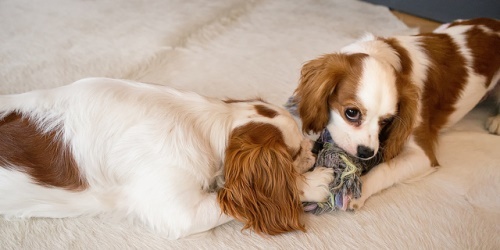 In the picture above, notice again the eyes are not on the object the dog is chewing, it is watching the other dog very closely in its peripheral vision and yet still has both bones in it’s line of sight. The dog is very still, and the body is very rigid. He has angled himself not only over his bone, but slightly over the second one as well. His body language is telling me very clearly that he is ready to spring into action should that other dog get an inch closer. (This was Shayna as my nephew approached). The second dog wants that other bone, and is looking at it very longingly.… but just like me, it is also reading the other dog’s body language VERY clearly, so it is not making a move toward it. Now, look at the difference in the second picture. 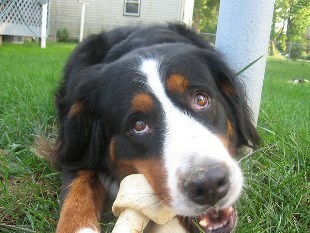 The Bernese Mountain Dog is very relaxed, eyes are soft and the face is open and inviting, and she is digging into that bone, but there is no sign at all that she is on alert. 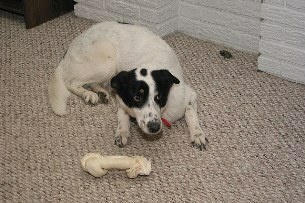 I would feel comfortable approaching this dog with her bone unless her body language changed as I got closer to her. Now unlike what we did in the last pictures, where I showed you contrasts to see the differences, in the next two I want you to see the similarities….which is why I placed them side by side. I seriously hope that no one would ever have to tell you to stay away from the Rottweiler on the left, who is showing all the obvious signs of all-out aggression… you do not have to look any further than the teeth. And I am sure the breed alone would have many people leery to begin with. 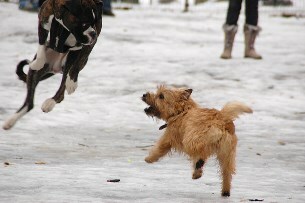 But now, look at the Terrier with the bone on the right. It is not snarling, growling, or showing any teeth…. But barring that, do you see ANY difference in their bodies? Because I sure don’t. EYES: They are both doing a dead-on stare. Their eyes are fully opened and round. TORSO: They are both frozen in place, rigid from head to toe, and other than the growling that I am sure the Rottie is doing, and the jaw muscles flexing, they are pretty much not moving a muscle. MOUTH: Jaw is set and tight as a drum. HEAD: Very low… almost equal to their torso, in a ‘Don’t mess with me” position. FRONT PAWS: Spread wide apart splayed to the side, both guarding their possession , and ready to spring into action. BACK PAWS: Rigid… you can almost see the muscles flexing and tense. Both of them have their ‘toes’ curled in obvious annoyance. I thought it was important that people see a dog does not necessarily have to be showing teeth for parents to be aware that their dog is showing signs of what we call ‘possession aggression’ or ‘resource guarding’. III. DOES THE SIZE OF THE DOG MAKE A DIFFERENCE? Let’s see how much you have learned so far. Would you approach either of these guys? NOTE: My explanations of these pictures do not just apply to the guarding of resources. If you are out with your child, and someone walks by with a dog, even if you had asked if your child could pet the dog and the owner has assured you that the dog is friendly, if you see any of these ‘guarded’ signs, walk away. That dog, for whatever reason, is not in the mood to be approached. I hope some of this has been educational for you, and maybe given you a slightly different perspective than you had before you read it. Just to reiterate, this article is not intended to be a ‘crash course’or make you an expert when it comes to pet behavior. It is simply to make you aware of potential threats to you and your loved ones. The unfortunate fact is that thousands of adults and children get bitten every year, most often by their own family pet. Even the sweetest, most loving of animals can have a bad day and it’s up to us to recognize the signs so that all of us, kids and pets included, can stay safe.